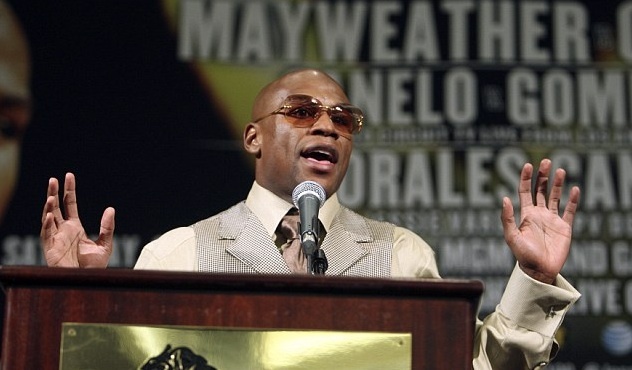 Mayweather Cries, Blasts Pacquiao in Post Fight Press Conference: is he laying the groundwork to keep dodging Pacman? Looks that way. Now, rebutting Mayweather is probably not worth the keystrokes but just in case anyone doesn’t remember — Mayweather fought Hatton at 147 after Hatton had fought his whole career at 140; Pacquiao fought and destroyed Hatton at Hatton’s preferred weight of 140. Pacquiao came up two full weight classes to take on ODH; oh, never mind. The point here is that my take on it is that Mayweather post Ortiz (meaning post having gotten shoved around in the fourth round by a volume puncher before ending it with a sucker punch, and further meaning Mayweather with his raw emotions pretty much exposed, witness the bizarre crying episoe) wanted nothing to do with Pacquiao, and that is probably a clue. An hour after extending his record to 42 wins from as many fights and claiming the WBC welterweight title in the MGM Grand Arena on Saturday night, the 34-year-old Mayweather stopped in mid-tribute to the many people who surround him and cried. For fully a minute the fighter with a mouth as fast as his fists and instincts fashioned on the streets was a blubbing, speechless wreck. Richard Schaefer, chief executive of Golden Boy, handed him a bar towel and Mayweather wiped away the evidence of his emotional vulnerability. Bemused reporters watched and waited to question him about the sneakiest of late right hands that left Ortiz in a heap in his own corner at the end of the fourth round. Anyway, it’s probably to soon after the Ortiz fight to make too much sense out of Mayweather’s behavior — but pulling back from it all, it just doesn’t seem to me to be very likely that Mayweather is going to risk his “O” in a fight with Pacquiao after he narrowly escaped being exposed by Ortiz, who was defnitely behind Mayweather at the end — but was coming on and seemed to be walking through mayweather’s best punches, and was starting get up a head of steam and gaining confidence. Would Ortiz have beaten Mayweather? Probably not. But from Mayweather’s perspective, the young fighter who rehydrated to 160+ pounds was definitely evolving into a legitimate threat as the fight went on, and it’s a very good thing for Mayweather that he didn’t have to go on past the 4th round. Mayweather-Ortiz: Can anyone imagine Manny Pacquiao doing what Mayweather did? Or what Ortiz did, for that matter?